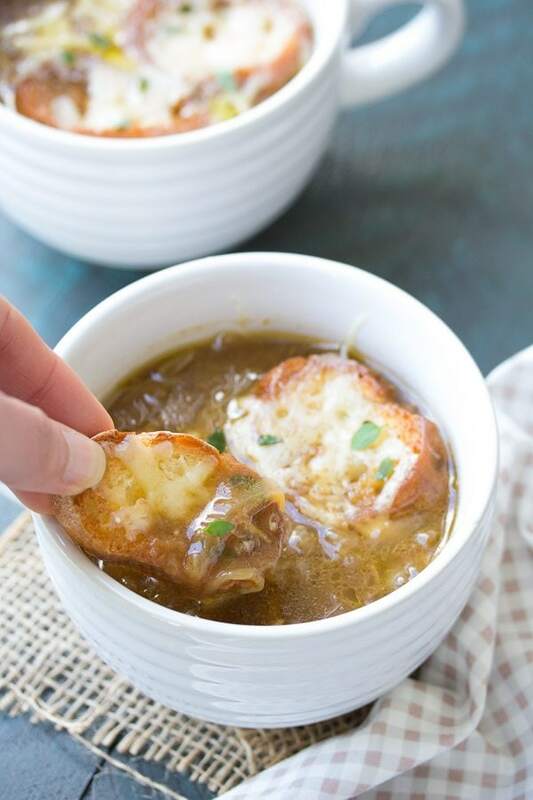 This Easy French Onion Soup is rich, comforting and so good with toasted cheesy bread for dipping! 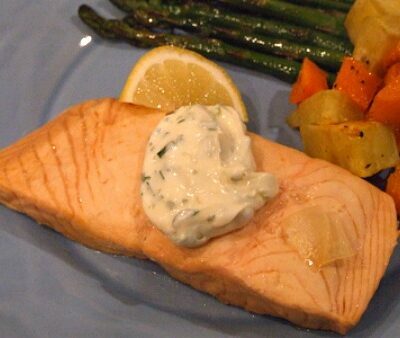 There is a short video showing you how to make this recipe toward the end of this post. Lately I’ve been craving soup on a weekly (sometimes daily) basis. It makes the perfect lunch. I can make a big pot of soup on Sunday and then portion it out to take to work with me over the next few days. Lunches made and ready to go for days? Yes, please! Recently I made a big pot of this French Onion Soup, and it was delicious for Sunday dinner on a cold, rainy day. There’s something magical about toasted cheesy bread on top of a hot bowl of soup! 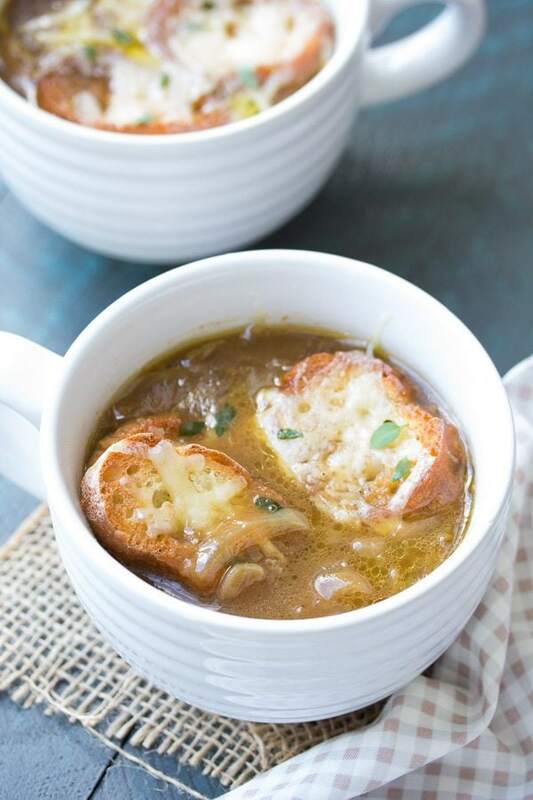 When I make this French Onion Soup, I like to make extra slices of cheesy bread for dipping. 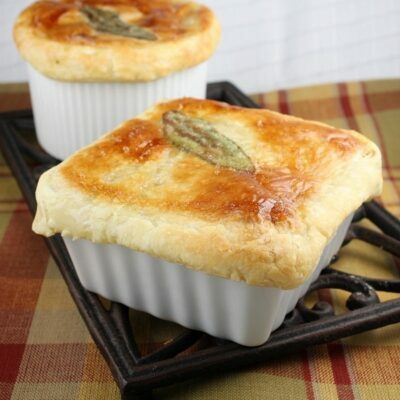 You can add them to the baking sheet when you put your soup bowls into the oven under the broiler. The leftovers of this soup make a delicious lunch that you will look forward to eating! If you do have leftover soup, don’t add the cheesy bread until right before serving. With my leftovers, I served bread on the side since I didn’t have time to worry about putting my soup under the broiler at lunchtime. 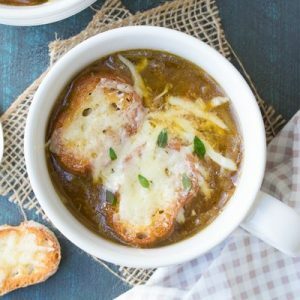 Do you order French Onion Soup often when you eat out? I rarely do, but I really enjoyed this homemade version. 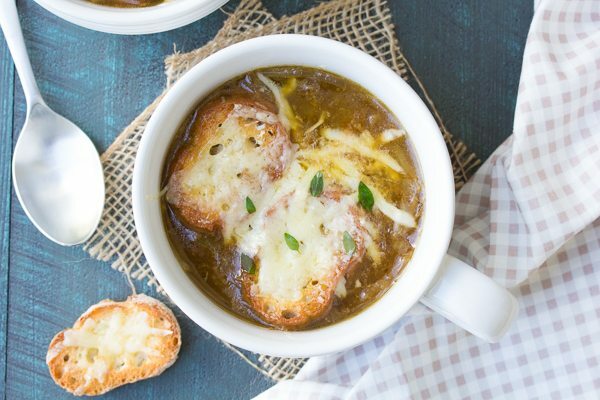 As you expect from French Onion Soup, this soup is rich and comforting. Slowly caramelizing the onions on the stove brings out their sweetness and adds so much flavor to this soup. Really, you won’t believe how easy it is to make! Recipes for French Onion Soup will vary in their ingredients and cooking methods. I tried to keep this one as simple as possible. I think you’re going to love it! Click below to watch a short video showing you how to make this recipe, then scroll to the bottom to print out the recipe and make it at home! Melt the butter in a large pot or Dutch oven over medium heat. Add the olive oil, onions and sugar. Cook, stirring occasionally, until onions are soft, lightly browned and caramelized, about 30 minutes. Add the salt, pepper and flour and cook, stirring, for 1 minute. Stir in the beef broth and add the bay leaf to the pot. Increase heat to bring to a boil. 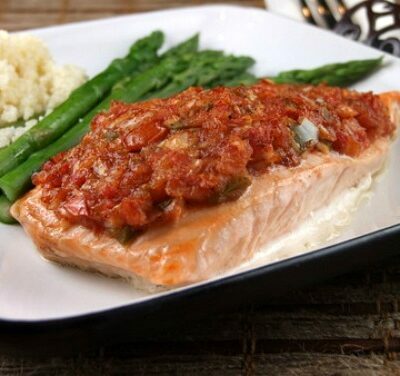 Reduce heat to medium-low and simmer for 30 minutes. Taste soup and season with more salt and pepper as needed. Place baguette slices on a baking sheet and toast under the broiler for 2 to 3 minutes, until lightly browned. Spoon soup into 4 oven-safe bowls. Place 2 baguette slices on top of each bowl of soup. Sprinkle on grated Gruyere and Parmesan. 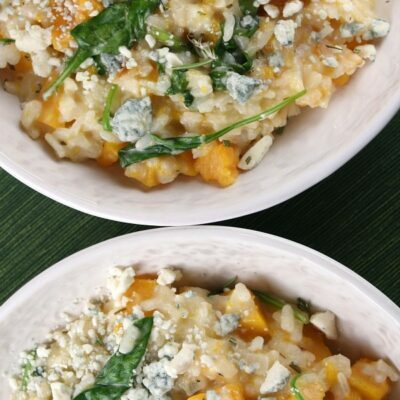 Place bowls on a rimmed baking sheet and transfer to the oven. Heat under the broiler for 2 to 3 minutes, until cheese is melted and lightly browned. Serve. If you don't plan to serve the soup right away, or if you have leftovers, wait and prepare the cheesy bread topping right before serving. I love it when I get a picture with the recipe because I print them out. I am much more likely to use it over and over when I am looking for a recipe among many recipes. Amazing soup! Been searching for a recipe that tastes like one from the French style chain (minus the beer) and FOUND it! Even without the cheese/ bread it tastes so good. Thank you for sharing.